VH-YQS is the first of five two-class 717s for QantasLink and will feature a new business and economy product in a 12 Business, 98 Economy configuration. A full cabin refurbishment will see the 717s have a toilet relocated forward, and a new galley installed in the rear of the aircraft – short sectors mean the half galley does not require cooling or plumbing services – as well as QStreaming WiFi entertainment for iPads installed throughout. 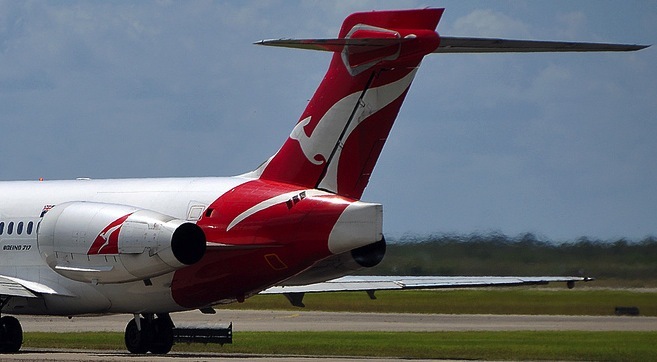 Plans see Boeing 717s gradually replacing all Qantas Boeing 737 services to Canberra from Brisbane, Melbourne and Sydney, as well as all 737 and Bombardier Q400 services from Melbourne and Sydney to Hobart. Allowing the redeployment of these aircraft on to other parts of the Qantas domestic network. Although production of the 717 ceased in 2006, its niche market positioning, financial uncertainty and various airline bankruptcies resulted in a large number of production aircraft moving in and out of storage since assembly. The result is an efficient fleet of low hour, high cycle frames that have many years of life left. While some suggest the 717 programme was hampered by a lack of commonality with other Boeing aircraft, it offers exceptional seat kilometre costs. And, happy to go up and down 15 times per day, the 717 has proved itself adept in performing on short, high frequency sectors. Learning from issues with the DC-9, ease and speed of maintenance was at the forefront of the 717’s design with highly modular airframe and engine components. Simplification increased utilisation by reducing time on ground, while both the frequency as well as the length of C and D checks was reduced; by way of example, none of the line-replaceable units on the 717’s Rolls Royce BR715 engines takes more than an hour to exchange. VH-YQS will enter service on 15 November operating between Canberra and Brisbane. *updated 27 September – Thanks to the reader who pointed out that I’d mistakenly aged the 717 by a decade, stating production ended in 1996 rather than 2006; first flight was 1998. Welcome back, 717, you look great!